Getting a new kitchen toy always opens up new and exciting doors to me, but it's funny that I still always start with the old classics. When I got my cast iron skillet I had to make pancakes and fried eggs. The first thing in my smoker wasn't salami or a pig head, but chicken and ribs. The PolyScience Immersion Circulator is the same thing. There are some wild possibilities out there, but the first thing I cooked in it was the dead simple 62 C eggs. This post is about another dish that I've seen a lot, but just had to try for myself. 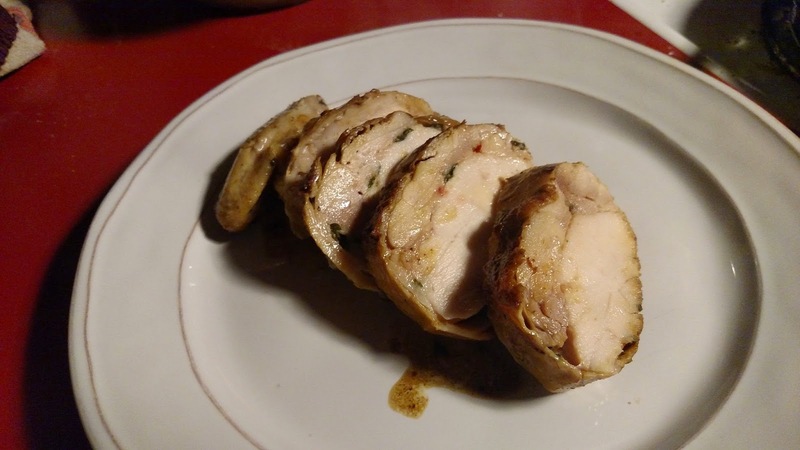 It's a chicken roulade: a chicken boned out and rolled up. Classically, the dish might be just the breast completely wrapped in the skin (or bacon) in a roll shape. But with a immersion circulator, you can perfectly cook through both the dark meat and the white meat at the same time. In the Momofuku cookbook chef David Chang explains being inspired by friend and fellow chef Wiley Dufresne and his recipe for a "chicken ball." Wiley would bone out a chicken, wrap the white breast meat with the dark thigh meat, then wrap everything in the skin. Cooked through in a water bath to 160F, the chicken ball would be deep fried to quickly crisp the skin. The result was a trifecta of perfect chicken cookery: crisp skin, tender dark meat, juicy white meat. To hold the meat together the dark and white meat were bonded with transglutaminase, sometimes sold under the name "moo glue." 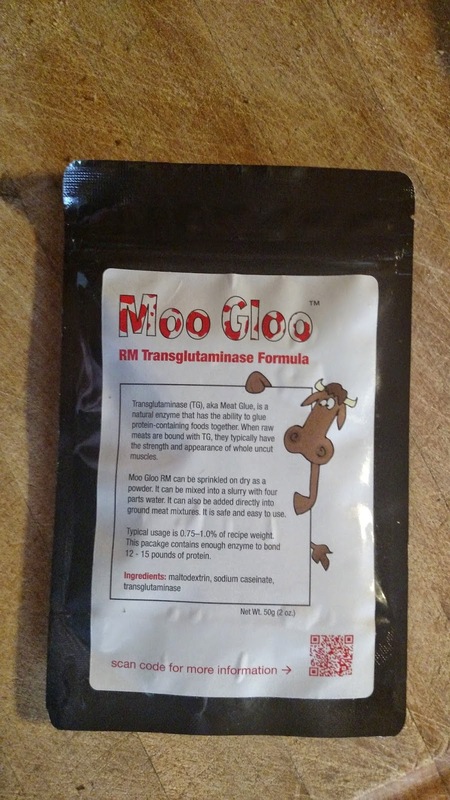 Transglutaminase is an enzyme that bonds proteins together and can be harvested from animal blood. 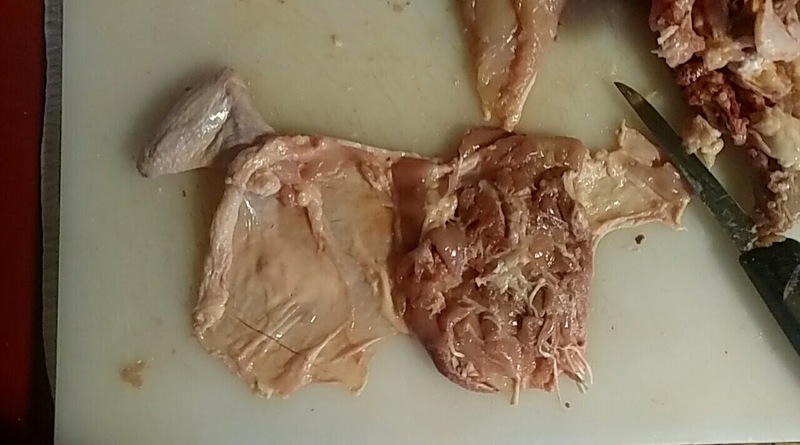 So by sprinkling a little bit of transglutaminase on the surface of the white and dark meat, you can bind them together into a single piece, sealing them into a single piece of meat that won't fall apart when cut with a knife. For my own recipe I kept the more natural shape of a chicken breast rather than forming it into a ball. 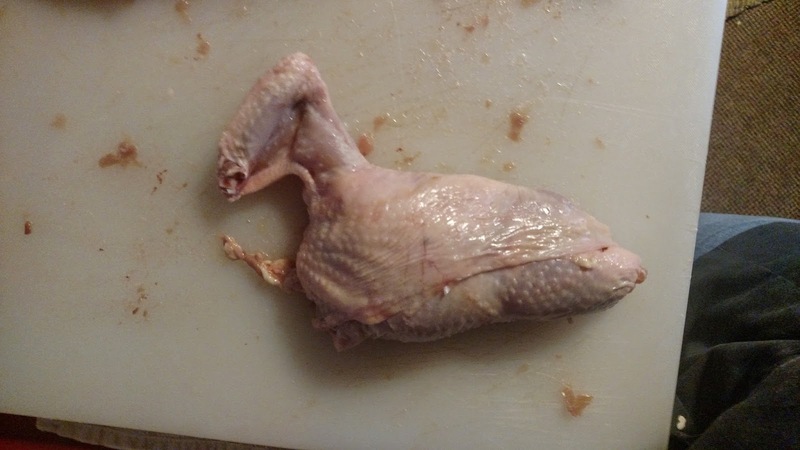 The breast meat was in the center, surrounded by thigh meat, and wrapped up snugly in skin. Between these layers of white meat, dark meat, and skin I sprinkled salt, pepper, thyme, red pepper, and transglutaminase. 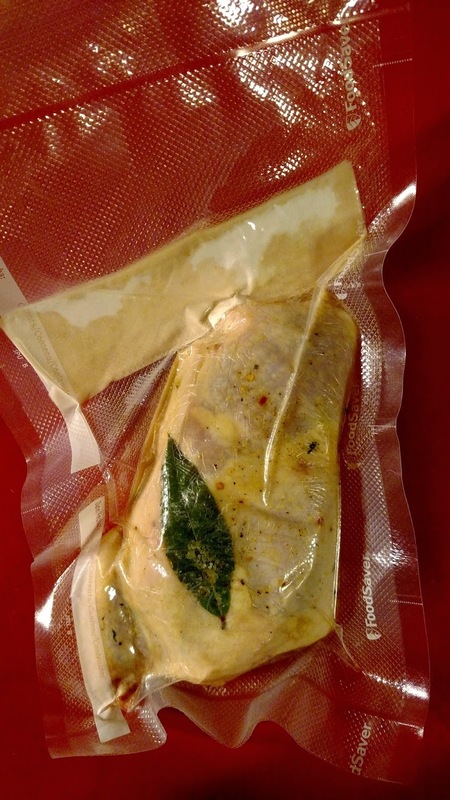 Vacuum sealed with a bay leaf, I put them in the fridge overnight to help the meat seal up and infuse with the herbs. I cooked these in a 160 F water bath for an hour until they hit an internal temperature of 160 F. Carefully unrolling the first breast, I was surprised how tightly the meat was bound. It really had become a solid, uniform piece of chicken. Browned in a pan the skin did crisp up, but I see why Wiley deep fries these. The sides and wing were very hard to brown, even spooning hot butter and oil over the skin as the rest of the chicken was seared. Submerging the chicken in a deep fryer would allow all of the skin to be crisped up. I enjoyed this dish, which did get a nice herbal flavor permeating all of the meat. It's a unique technique with great presentation, but a lot of work for chicken-on-chicken. It's funny - the dish was perfectly cooked, but for the work involved I wonder if it would be better to make it a bit fancier, perhaps by making a chicken mousse to fill the skin. 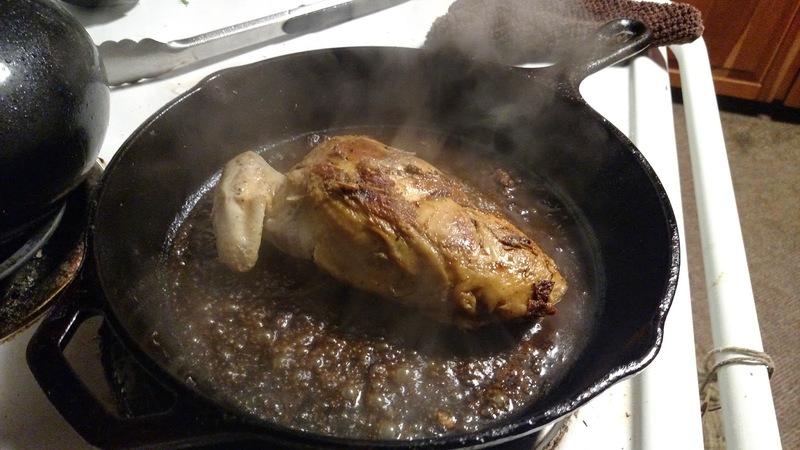 Otherwise you could just cook a half-chicken on the bone in a water bath and not fuss with boning them out. I might try this again and stick with the "chicken ball" to see how that might be a better use of the technique. Can one really beat a good quality chicken, roasted in a wood fired oven? Salt, dried herbs, and olive oil, is all one needs; nothing beats it. What really needs special attention is Pork. I don't think you can beat it - I have a long running joke with my wife that whenever I want to celebrate an especially good day I roast a chicken. It perfectly satiates every gustatory urge. I think what I like about your treatment of this technique and dish is your honest appraisal of the outcome.